According to the data from the 2010 census, Spring is the home of about 55,000 persons. This town is part of Harris County and is located at the junction of Hardy and Spring-Cypress roads. Spring was originally inhabited by native Americans. After the immigration of people from different areas, the economy of Spring began to grow with the major contributors being cash crops and vegetables. Before its economic growth, there was a trading post in Spring which was established in 1837. The construction of the International and Great Northern Railroad which passed through Spring led to more economic development of the area. With this development came notable facilities such as a post office and a bank, attracting more residents. The influx of rail workers associated with the commissioning of the International and Great Northern Railroad led to the growth of the population of Spring and its surrounding areas. Later on, Spring was developed as a tourist area that with a shopping area specially developed to attract tourists. Old Spring Town, the shopping area developed to attract tourists still holds that appeal to date. Spring holds a variety of recreational facilities which still attract tourists till date. There are four parks in the Spring area. The parks hold both family-friendly and age-appropriate facilities which include a barbeque pit, picnic areas, softball fields and baseball fields. The Mercer Arboretum and Botanic Gardens is another recreational facility that appeals to both residents and visitors of Spring. This facility is equipped with several recreational amenities including a beaver pond. Cypresswood Golf club is also located in the Spring area and is a notable recreational facility. 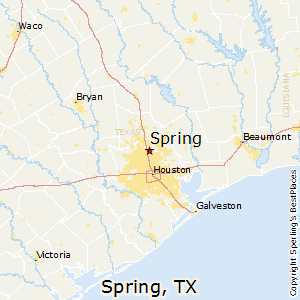 Spring is part of the Houston–The Woodlands-Sugar Land area of Texas. M&M moving company serves the entire area with the best quality of moving services. Our moving services are tailored to the needs of our customers, and we aim to impress our customers every time they engage our services. Our movers are not only licensed to carry out moving services and equipped with routine training, but they also do their jobs with the highest level of customer satisfaction in mind. Our services are ideal for even the most delicate property as we handle all items with expertise. You are sure that no harm will come to your goods and properties with M&M moving company. You can engage our services for both short-distance and long-distance destinations. No matter the distance, we handle your goods and properties with the highest level of professionalism. You can also engage our services for packing, even if you do not need us to do the moving. Instead of entrusting your prized possessions to persons who you’re not sure of their competence, try us. M&M moving company offers both expertise and experience. We have provided the best quality of moving services in Houston for over two decades, and our customers have never been unsatisfied with the quality of our services. M&M moving company is the best way to move. We give our best every single time.